The Hollywood Left, entertainers, singers and a justice of the SCOTUS are looking for a new country to live in today. 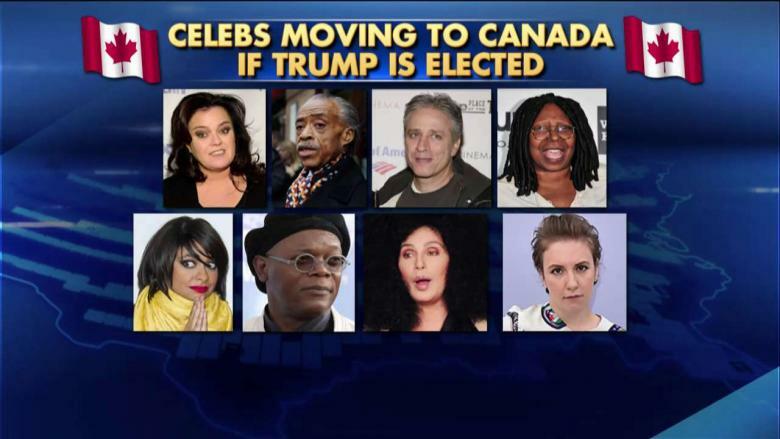 Many on the LEFT made the boastful comment that they would leave the United States if Donald Trump was elected president. Guess what, he was!!! Now it comes time for Whoopie, Babs, Cher, Amy Schumer, Bryan Cranston and the rest to make good on their promise. LEAVE!!! Supreme Court Justice Ruth Bader Ginsburg said she would leave as well. Guess what, you can start by leaving the SCOTUS. Jon Stewart even said he would consider “getting in a rocket and going to another planet, because clearly this planet’s gone bonkers” if Trump won. Once again, memo to the liberal left celebs, HE DID!!! By the way Jon, that can be arranged. Can you imagine how much the economy is going to be stimulated following this election as psych visits and Xanax will be needed in massive quantities. A final memo to the celebs above, let us know what country you move to and provide your address so that we can send you a Christmas card. Comedians: Comedian Amy Schumer said in September that Spain would be her destination of choice. Miley Cyrus … HO, HO, HO!!!! For Miley Cyrus what are the holidays without some Christmas “Twerky”? Obviously the 21 year old Cyrus could care less about being on Santa’s naughty list as she continued her raunchy behavior that has given her new found fame, or is it infamy? In typical Miley Cyrus fashion, she opted for naughty and not nice during her festive performance at the radio station concert at the KIIS FM Jingle Bill in Los Angeles. Way to keep it classy Miley.